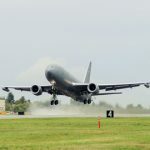 The first two Boeing KC-46A Pegasus aircraft have been delivered to McConnell Air Force Base in Kansas five years after the installation was selected as the first Main Operating Base, McConnell AFB said Friday. The base commenced construction of facilities such as an air traffic control tower, a fuselage trainer, technical training dormitories and aircraft maintenance hangars in preparation for the delivery. The projects resulted in jobs for local residents and $267M for Kansas’ economy. Additionally, McConnell AFB personnel worked with Boeing on technical orders for three years in the lead-up to the refueling tanker's delivery. Following KC-46A’s landing, the Air Force will conduct familiarization and initial operational assessments for the aircraft. The 931st Air Refueling Wing and 22nd ARW marshalled the aircraft to the Kansas base, which serves as USAF's main air refueling center.